A search-based interface that unifies your files, editor buffers, browser tabs, and other computing activities. Type stuff, find things. Results in 16 milliseconds or your money back. A design tool made for apps with a responsive layout engine and reusable components system. The digital medium needs CAD, not photo retouching and illustration tools. 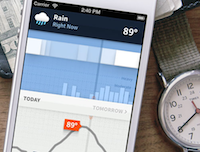 A beautiful, data-rich weather app for iPhone and iPad. Featured by New York Times, The Guardian, Wired Magazine, Fast Company Design, and many others. It’s the weather on your phone, people—groundbreaking. We consult on technical matters with our clients. When appropriate, we also design and implement bespoke data visualization software and workflows. We’ve developed iPad dashboards with wind farm technicians, web-based bioinformatics analysis tools with biologists, geographic displays for climate model verification, printed vitals reports for diabetics, and many other such projects. Keming Labs was integral to converting our rough specification into a flexible visualization front end. We were exploring new display ideas for rapidly evolving biological questions and they were able to deliver a customizable implementation that integrated within our existing code base. The resulting displays fit beautifully within our vision of the project and have enhanced our ability to communicate results with other researchers. Before launching MyClibe.com, we were wrestling with some major performance and stability issues in our system. Over those next weeks, Keming was essential to our development team, providing strong advice, direction, and absolutely fantastic development. From user interface to database, and from monitoring to performance tuning—Keming delivered. We highly recommend Keming, and will absolutely be calling on them again. Keming Labs is an exciting company to work with. They provided us with a top quality GUI in record time. They are very easy to work with, especially when our project has experienced tangents and new directions. I highly recommend their quality work. 2018 June 20 · How Finda uses websockets to communicate with your browsers and editors. 2018 May 10 · Logging errors and panics from a multithreaded Rust application to OS X’s Console.app. Also a debugging story. Keming Labs was founded by me, Kevin Lynagh, in the spring of 2011. We are a small company—just a handful of employees at any given time—and we don’t plan to expand. If you need a hierarchy of project managers or want to work with an exploding startup, look elsewhere. We are a focused team of professionals dedicated to advancing the design & computing state of the art for our clients. Keming Labs is based in the American Pacific Northwest. When not visualizing data, odds are that we’re either drinking fine craft beer, rock climbing, or fly fishing.